The vine and the branch truth emphasizes the indissoluble union of Christ and the believer. We are organically one. One tree, one life; yet in that relationship Jesus underlined the fact that we, the … continue reading. 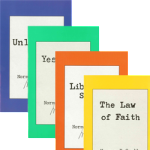 Tape Review: Alphabet Soup, by Page Prewitt You’ve heard the truth of your union with Christ; you’ve believed it; you’ve taken it as your truth; you know you are not an independent person— just … continue reading. The Bottom of the Barrel When the moment came, linked to a great crisis in the mission, God (although unknown to myself) had me prepared. This is always His way, so that no glory can come to man. In … continue reading. Galatians 2:20: Not “Just Me,” but Christ As Me! Please see PDF pages 14 and 15. … continue reading. Dec 22. 1971 Dear Ivy, You pop in such intriguing questions dear. I think the big final step is from “I do nothing…He does all” to “I do all, because I am He in His Norman (Ivy) form!” Of course … continue reading. Please see PDF pages 8 and 9. … continue reading. Faith is action: the whole man in action, spiritual, mental, physical…Because it is action, it has certainty, and not doubt, as its motivating power. Faith therefore always has the thing in its grasp … continue reading. Q: I know the Bible says, “In all things give thanks,” but how can I reconcile the love, goodness and care of God with the pain and suffering I’m going through? What is God’s purpose in permitting … continue reading. No pain, no gain. We’ve all heard this saying (usually in the context of physical exertion). But have you ever really stopped to think about its meaning? It seems to be a law that people achieve great … continue reading. Now I myself, being spirit, am meaningless in relation to others unless I have a means of expressing my spirit-self; and that, in Bible terms, is my soul and body. My soul is my emotions and reason, … continue reading. 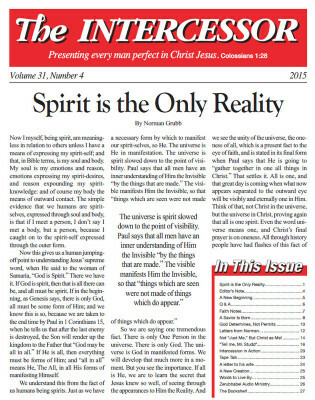 In a recent issue of The Intercessor was an article entitled My Pearl of Great Price" by Shay Trethewey. If, like me, you read that article and thought (gulp): "My pearl of great price is or was … continue reading. "Tell me, Mr. Studd" An excerpt from "Christ in Congo Forests," by Norman Grubb. "A CHOSEN VESSEL…AN EARTHEN VESSEL…a prepared vessel." That is how God describes His men of destiny. And when He … continue reading. A Chapter Review from Who Am I?, by Norman Grubb What a privilege it is when the Holy Spirit reveals spiritual truth to us. He does this in many ways: through the Bible, Christian literature, other … continue reading.